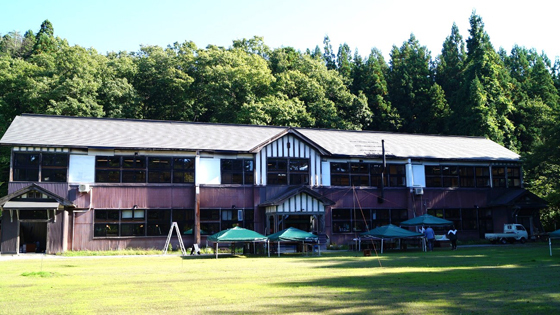 Nishiaizu International Art Village occupies a wooden former school building. My interest was piqued when I heard about a run-of-the-mill rural community in Fukushima Prefecture that is attracting people through art. The town of Nishiaizu is located in the westernmost part of Fukushima Prefecture, near the border with Niigata Prefecture. Situated in a mountainous plain occupied by rice paddies and fields, the mainly agricultural town covers an area about half the size of Tokyo’s 23 central wards and consists of 89 hamlets with a total population of 6,300 people. It is a typical example of a depopulated area. In 2004 the Nishiaizu International Art Village opened here in a vacant old wooden building that used to be a junior high school. Since its establishment, the village has engaged in international exchange through art by inviting foreign artists, and it also holds an annual exhibition open to entries from across the nation. I visited the town during the 13th NIAV Exhibition 2018. Yoshihiro Yabe, who is responsible for the art village’s activities as its current director, told me about the NIAV. Apparently, when the art village was founded, a person involved in its business suggested that they invite artists from around the world and provide them with a studio. Since that person had connections with foreign embassies in Japan, exchange with foreign artists began. Until now a total of nearly 200 foreign and Japanese artists have lived in the art village as artists-in-residence, engaging in creative activities and participating in exchange programs with local residents and others. Mr. Yabe himself was born in Nishiaizu as the nineteenth generation of a farming family that has continued its business since the Edo period (1603–1868). After studying design at the graduate school of the Nagaoka Institute of Design, he went to study landscape architecture1 at the graduate school of the University of Manitoba in Canada, acquiring master’s degrees from both universities. He then teamed up with a Canadian friend and began a design business in Canada and Shanghai. After the Great East Japan Earthquake in 2011, however, he became concerned about Fukushima. Invited by an acquaintance, in April 2013 he took up the position of permanent staff member of the NIAV, the second person to hold that post. 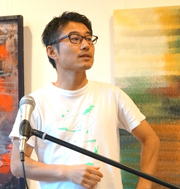 Since then, as well as activities directly related to art, such as the artist-in-residence program and the annual exhibition, he has been planning events related to local culture and cuisine in an effort to reappraise local culture and the daily-life wisdom of traditional rural communities, which are being lost in modern society.